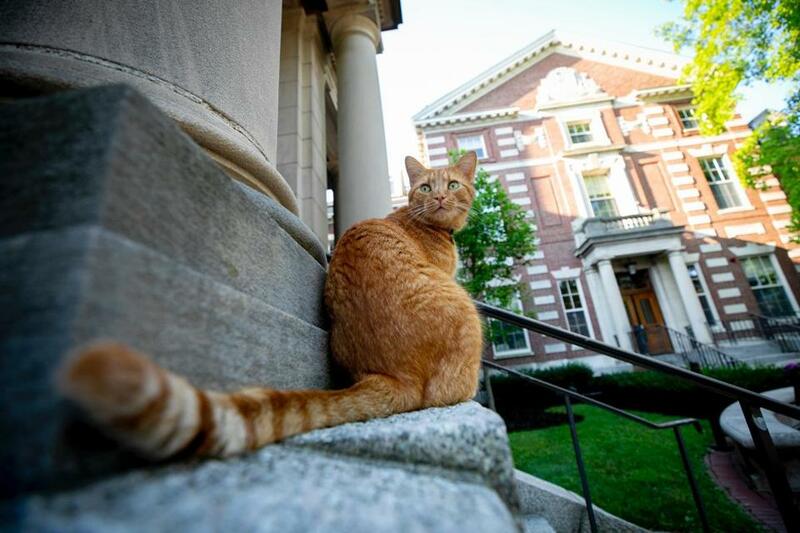 Despite being a cat, Remy is seen hanging out near Harvard’s Barker Center. John Harvard, the minister whose donation of £400 helped establish the Cambridge university that bears his name, is the official mascot of Harvard University. The sports teams at Harvard are called the Crimson. But walk the campus and you might find a much-celebrated unofficial mascot lurking in the rooms of the law school or stalking through the grass outside Pierce Hall. His name is Remy. He is a cat. Remy, an orange tabby, wanders the school in search of patches of sunlight, snuggly boxes, and friendly interactions. He’s wildly popular — a Facebook page dedicated to “Remy the Humanities Cat” has more than 2,500 followers. He was featured in a Harvard Gazette article in the fall that was among the campus news site’s best-read stories of 2018. And he recently was the star of his own Twitter moment. Remy’s Facebook page features photos of him prowling the grounds of the Graduate School of Design, the Barker Center (he doesn’t seem to mind the name), and Cabot Library. Fans submit action shots of Remy doing his thing around campus — often enough, his thing is sleeping. Some Harvard staff who see Remy on a regular basis have even created some special spots for him to visit. He seems to particularly enjoy the law library, which he returns to regularly. According to the Gazette, his owner is Cambridge resident Sarah Watton, who lives on Sacramento Street less than a mile from campus. She says Remy’s popularity has helped her family track their adventurous pet as he wanders. “We really appreciate Remy’s community and the love and happiness he spreads wherever he goes,” she told the Gazette. Remy did get lost for a short stretch once over the summer and his online community briefly panicked, but after a few weeks, his page reported his safe return to his owners. Still, not everyone is familiar with Remy. Law professor Annette Gordon-Reed tweeted a photo Tuesday of Remy slinking along a hallway at the law school and said this was the first time she had seen the feline on campus. Remy’s many fans and supporters quickly spoke up to let Gordon-Reed know that the kitty is well-traveled and a Remy appreciation fest promptly began.